Cranston East wins Senior Game, 5-0! The Cranston East Seniors were honored at their last home game. Standing with the 10-0-3 Thunderbolts are members of their family and coaches Rich Grenier Jr. and Rich Grenier Sr. The 'Bolt still have one more home game when they play host in the Quarter-Finals. Cranston East was a force in 2015! Although the 2015 season came to a disappointing end for the Thunderbolts of Cranston East, their season was filled with many memorable moments as they posted a 10-3-3 seasonal record. This marked the third consecutive year that Cranston East has finished with 10 or more overall wins. Over the past three seasons, the 'Bolt have won 31 games in Division III competition, finishing second place in 2015 and advancing to the Division III State Playoff Semi-Finals twice in three years. In addition to having a successful season on the pitch, the 'Bolt, who received the RISOA Sportsmanship Award in 2014, displayed great sportsmanship. In fact, they ran a streak of 31 consecutive games without being issued a card. Cranston East wins annual City Cup! 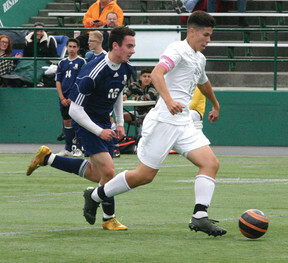 Led by another strong defensive effort from Patrick Finucane (sweeper), Keith McAteer (marking back), Pedro Saravia (marking back), Ayo George (stopper) and the timely saves of senior Jarod Linne (9 saves), the Thunderbolt of Cranston East won their second consecutive City Cup Championship over the Falcons of Cranston West, 2-1. After a scoreless tie at intermission, the 'Bolt scored when Jason Venda passed to Tiago Pacheco, who dribbled to his left and blasted a shot by Gianluca Laurenza for 1-0 lead. 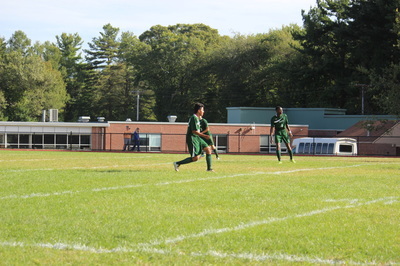 With under 15 minutes to go in the match, Pat Finucane sent a ball over the West defense to sophomore Richmond Miamen, who tapped a shot by an on-rushing Laurenza to make it 2-0. In a fast and furious final ten minutes, Cranston West tied the game when Derek Motta centered the ball in the box to Christian Martinelli who headed the ball past Jarod Linne. The Thunderbolt (9-0-2), however, would not relinquish another goal as they won their ninth game of the year. 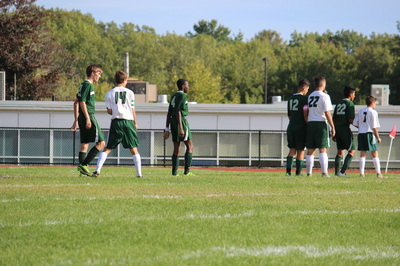 During the match, Cranston East had two impressive streaks stopped. First, the goal allowed in the final ten minutes of the game was the first one an opponent has been able to get past the 'Bolt in October. They had gone 310 minutes without giving up a goal. In addition to that, the Green and White, who has been recognized for their outstanding sportsmanship on the field over the past two years, was issued their first card (caution for pulling a shirt) in 31 straight games played dating back to last season (2014). 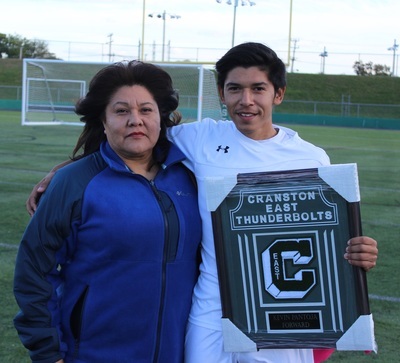 Now that the Thunderbolt have reached their first goal of the season (City Cup Championship), they have their eyes set on winning the school's first league championship since 1974. With four games remaining, Cranston East (8-0-2 in league play) hopes to build on their five point lead. 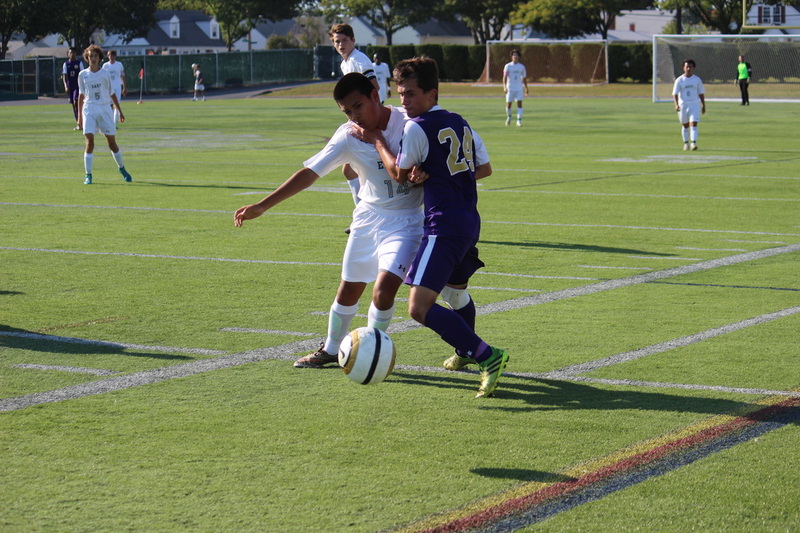 East gains point in 0-0 tie with EWG! Jarod Linne records 10 saves. 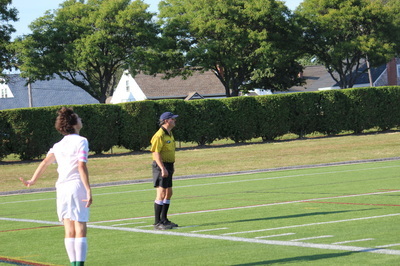 Despite being held scoreless in their first game of the season, the Thunderbolts of Cranston East stretched their lead over second place Burrillville to five points with a tough 0-0 tie against Exeter-West Greenwich. Austin Larson, the Scarlet Knight goalkeeper, did what no other team has been able to do this year by shutting out the 'Bolt with ten saves. Jarod Linne, East's senior goalkeeper, was equally impressive with ten saves. In fact, his late heroics with under two minutes remaining in the match secured his fourth shutout of the year. 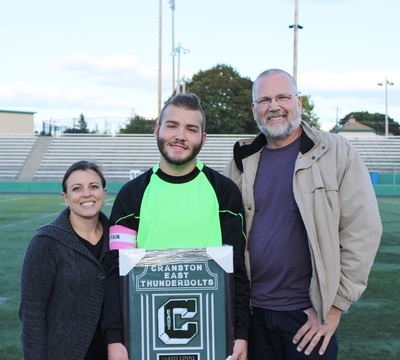 After the 'Bolt defensive line uncharacteristically broke down, Linne made two spectacular saves inside the six yard line when EWG's lone forward, Christian Soucy broke free inside the box. After deflecting his first shot, Linne held onto Soucy's follow up shot. The 'Bolt had several chances that they simply could not capitalize on. In the second half with under 15 minutes to play, sophomore Richmond Miamen found himself inside the 12 yard line with an open net. His shot, however, flew over the net. 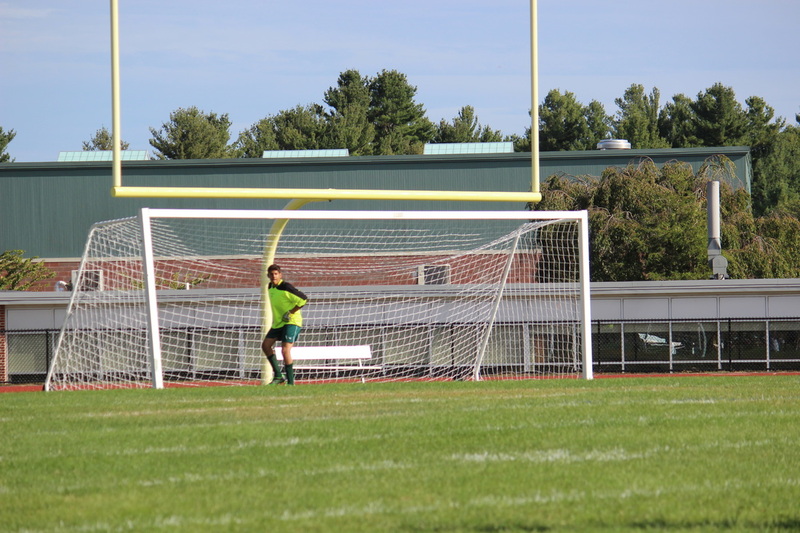 With under 10 minutes to play, senior Tiago Pacheco jumped high in the air and perfectly headed a shot toward the "upper 90" when Larson made the save of the game for the Knights. 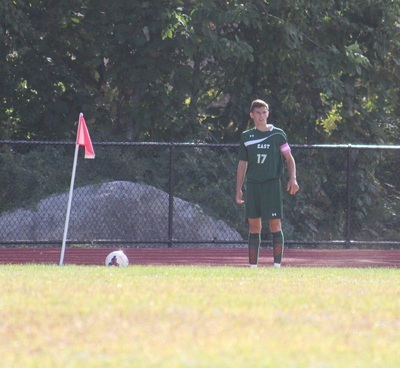 Lastly, with under 5 minutes to play, senior Pat Finucane took Kevin Pantoja's corner kick and blasted a shot off the goal post. 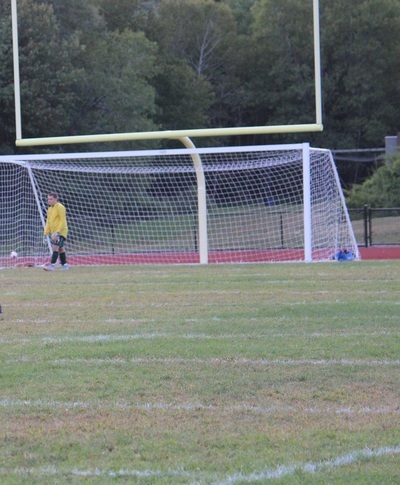 After playing in their annual Cranston City Cup against rival Cranston West, the 'Bolt (8-0-2) get back to league action with home games against Davies (6-2-1) on Wednesday and Warwick Vets (3-6-0) on Friday. Cranston East stands on top of Division III! 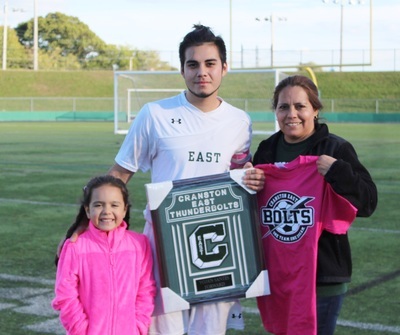 ​​If any ‘Bolt fans thought that losing First Team All Stater, Dennis Vazquez, was going to be a major loss, they have realized after a strong September that Cranston East (8-0-1) is once again on track to receive a high-seed in the upcoming Division III State Playoffs. In fact, East has jumped out to one of the best starts in the program’s 45 years history. At 8-0-1 (25 points), the Thunderbolt are in first place with five games left. They not only lead the state in goals scored (43), but they are second in goals allowed (5) behind Division I leading LaSalle (2). After shutting out Rogers, 4-0, to win their first league game, East suffered their only blemish to their season when St. Raphael Academy came back twice to tie them 2-2. Since then, however, the ‘Bolt have won seven consecutive games by outscoring their opponents, 37-4, and outshooting them, 197-73. 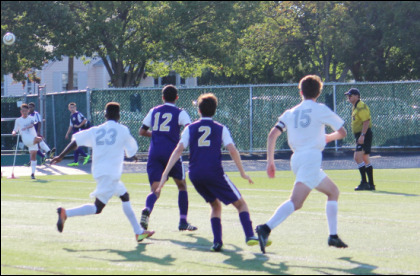 Defensively, they have one of their best back line of defenders in senior sweeper/stopper Patrick Finucane, sophomore sweeper/stopper Ayo George, senior marking back Keith McAteer and sophomore marking back Pedro Saravia. In addition, East has received solid play from senior goalkeeper Jared Linne (three shutouts, 35 saves and 5 goals allowed in six appearances) and freshman Giovanni Canales (2 shutouts, 11 saves and 0 goals allowed in four appearances). Offensively, Cranston East has one of the most balance attacks in the state in senior midfielder Tiago Pacheco (10 goals; 5 assists), senior forward Kevin Pantoja (6 goals; 8 assists), sophomore forward Richmond Miamen (9 goals; 2 assists), senior forward Kevin Donnelly (6 goals; 4 assists), midfielder Jimmy Vang (3 goals; 5 assists), George (3 goals; 4 assists), Finucane (3 goals), senior halfback Jason Venda (1 goal; 2 assists), sophomore midfielder Nathan Hardy (1 goal; 1 assist), sophomore Gabe Sotelo (3 assists), senior Yojan Santes (1 goal), junior Carter Haid (1 assist) and senior Ryan Raposa (1 assist). 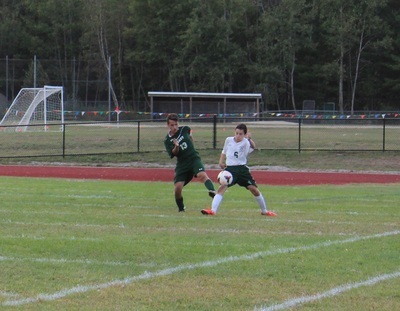 Senior Tiago Pacheco scored his tenth goal of the season against the Broncos. 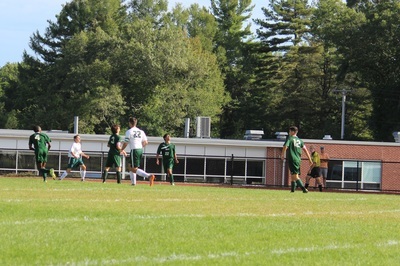 Lead by a strong second half surge, the Thunderbolts (8-0-1) won their biggest game of the year over second place Burrillville (7-2-0), 3-0. With the game deadlocked at 0-0, Gabe Sotelo sent a ball through the Burrillville defense to senior Kevin Donnelly who tapped a shot by goalkeeper Ben Lamoureux at the 13:07 mark. Three minutes later, East built a 2-0 lead when Tiago Pacheco found Richmond Miamen open in the box. With 9 minutes left in the match, they pulled ahead 3-0 on a corner kick when Kevin Pantoja found Tiago Pacheco alone at the top of the 18. Pacheco cut to his left and blasted a shot by the Bronco keeper. Defensively, the 'Bolts received another fine effort from defenders Pat Finucane (sweeper), Ayo George (stopper), Pedro Saravia (marking back) and Keith McAteer (marking back). Jarod Linne recorded 6 saves in net. Kevin Donnelly & Richmond Miamen celebrate after scoring a goal. 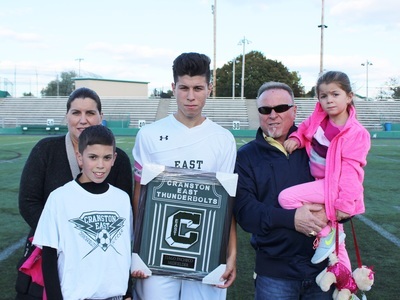 Two-time First Team All Division selection Jimmy Vang has had a solid year in the midfield for Cranston East this season. 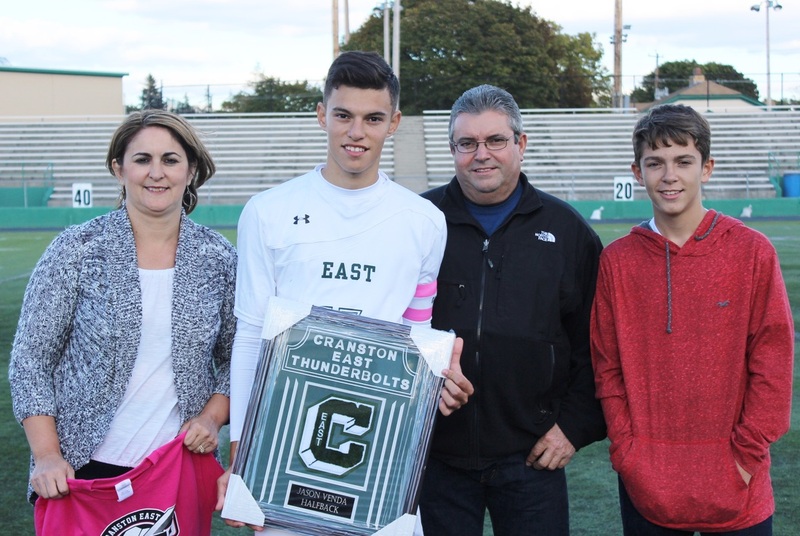 Lead by a balanced offensive attack, Cranston East won their seventh game of the year with a 7-0 victory over winless North Providence. The Thunderbolt, who recorded 225 passes in the match, were led by Kevin Pantoja (2 goals; 1 assist), Tiago Pacheco (2 goals; 1 assist), Jimmy Vang (1 goal; 2 assists), Ayo George (1 goal; 1 assist), Richmond Miamen (1 goal), Gabe Sotelo (1 assist), Jason Venda (1 assist) and Kevin Donnelly (1 assist). Goalkeepers Jarod Linne (6 saves), Gio Canales (2 saves) and Brandon Franco (1 save) combined for the shutout. Cranston East defeats Knights, 6-1! Sophomore Ayo George has been a force in the midfield this season for the Thunderbolts. 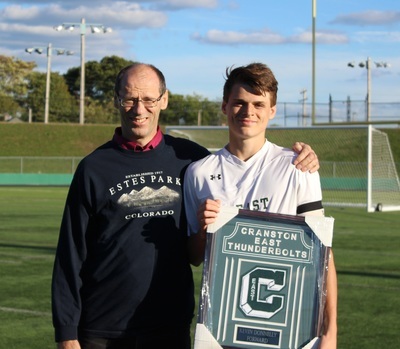 Led by the strong midfield play of sophomore Ayo George and senior Jimmy Vang, the Thunderbolt defeated PCD, the defending Division III state champions, 6-1. In the first 2 minutes of the game, Ayo George broke from the midfield, advanced inside the box and passed to Tiago Pacheco who beat PCD's goalkeeper to his left for a 1-0 lead. Seven minutes later, senior Jason Venda (corner kick) sent a ball to far post where senior Pat Finucane headed it in for the 'Bolts second goal of the game. At the 12:30 mark, George broke free down the left touchline where he found a wide open Kevin Donnelly at the far post to make it 3-0. The green and white made it 4-0 when Richmond Miamen found senior Yojan Santes open inside the 18. After giving up a goal on a penalty shot, East received two more goals from Tiago Pacheco (assist by Kevin Donnelly) and Jimmy Vang (assist by Kevin Pantoja). 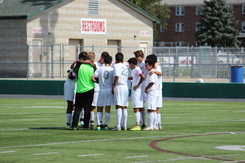 Prior to each half, the Cranston East soccer family huddles together before play begins. 'Bolt hold on against pesky Panthers, 3-1! Seniors Keith McAteer (front) and Pat Finucane (back) have helped form one of the best defenses in the state this year. Pat Finucane is known for his defensive presence for the Thunderbolt. 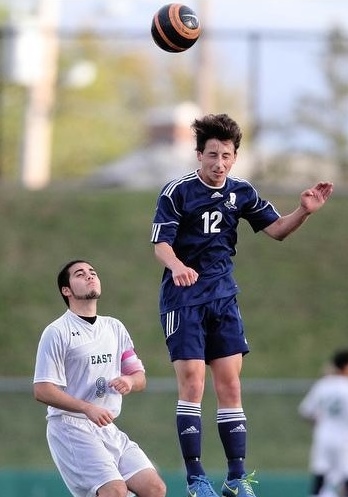 However, the senior helped East on the offensive side in their 3-1 victory over Johnston High School. At the 6:31 mark of the first half, Finucane took a corner kick from Kevin Pantoja and headed a ball past Johnston goalkeeper, Billy Petitto (14 saves) for a 1-0 lead. 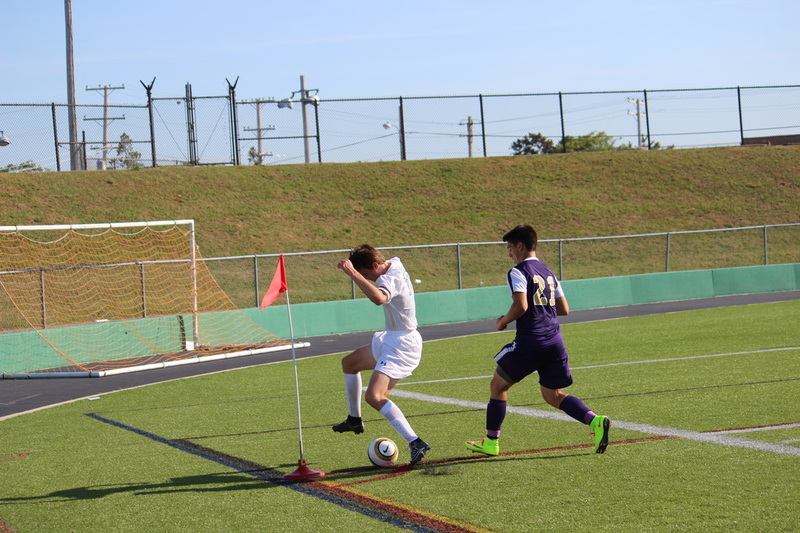 With 15 minutes remaining the the half, Richard Miamen made it 2-0 when he collected Ryan Raposa's cross and blasted a shot in the left corner of the net. 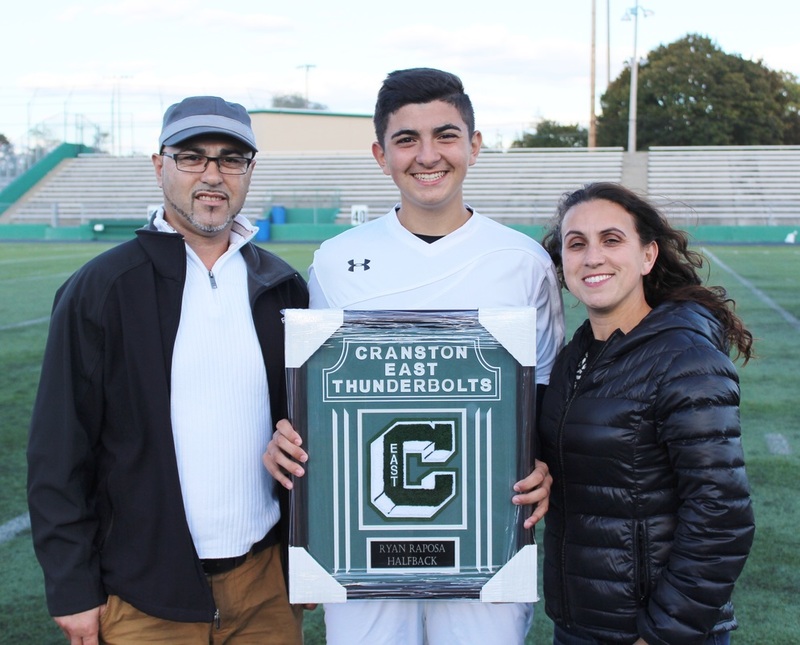 Despite out-shooting the Panthers, 26-10, in the game, Cranston East did not put the game away until the final minute of the game when Kevin Pantoja scored when he followed up Richmond Miamen's shot for the 3-1 victory. Cranston East coasts to 10-0 victory! After back to back Semi-Final appearances, the Thunderbolts hope to take one more step this season. 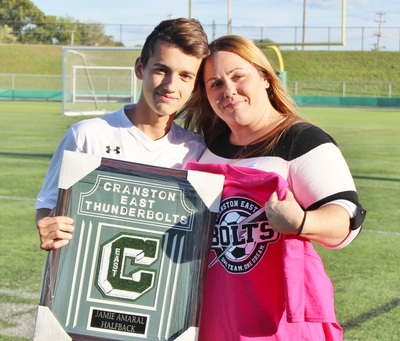 ​Cranston East coasted to a 10-0 victory for their third win of the year over Masters Regional. Offensively, the Thunderbolt received contributions from Kevin Pantoja (2 goals; 2 assists), Richmond Miamen (3 goals), Ayo George (1 goal), Patrick Finucane (1 goal), Kevin Donnelly (1 goal), Jimmy Vang (1 goal; 1 assist), Nathaniel Hardy (1 goal; 1 assist), Tiago Pacheco (2 assists), Fabio Canido (1 assist), Gabe Sotelo (1 assist) and Carter Haid (1 assist). 'Bolt strike often in 4-0 win over Chieftans! Senior Kevin Pantoja has become one of Rhode Island's best play-makers. He is among the top five in assists. 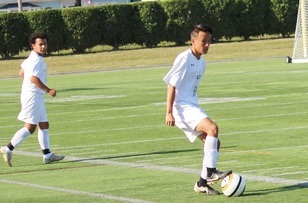 Sophomore Richmond Miamen and senior Tiago Pacheco each scored two second goals to help Cranston East to a 4-0 road win over Ponaganset. After playing a scoreless first half, the 'Bolt opened up their attack and struck three minutes into the second half when Kevin Donnelly found Pacheco open in the box for a 1-0 lead. 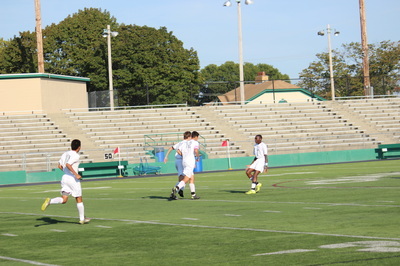 With twenty minutes left, the unselfish play of the green and white was in full throttle when Donnelly passed to Pacheco cutting into the box. Pacheco, then, squared a pass to his left to Richmond Miamen who scored easily for 2-0 lead. 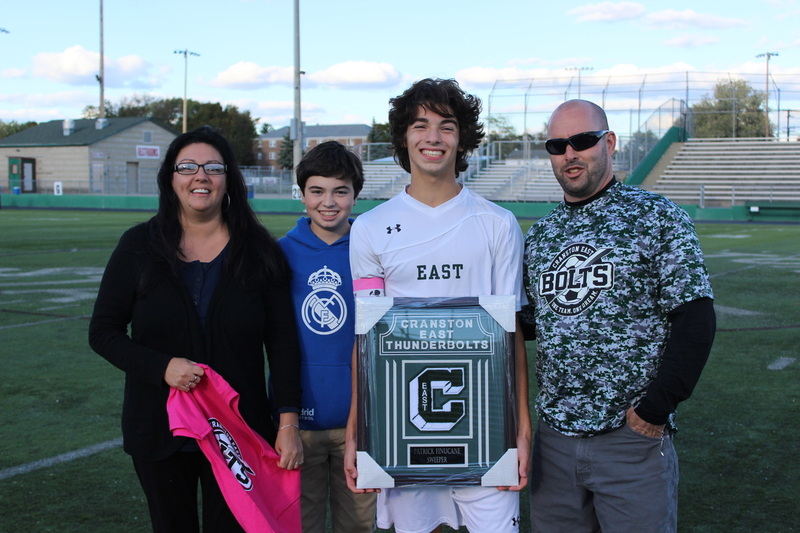 Defensively, East not only received stellar play from Pat Finucane, Keith McAteer, Pedro Saravia and Ayo George, but freshman goalkeeper, Giovanni Canales contributed with six saves. The seniors from Cranston East take a picture with their coach after finding out it was his 250th career win. Thunderbolt pull away from Spartans, 4-1! 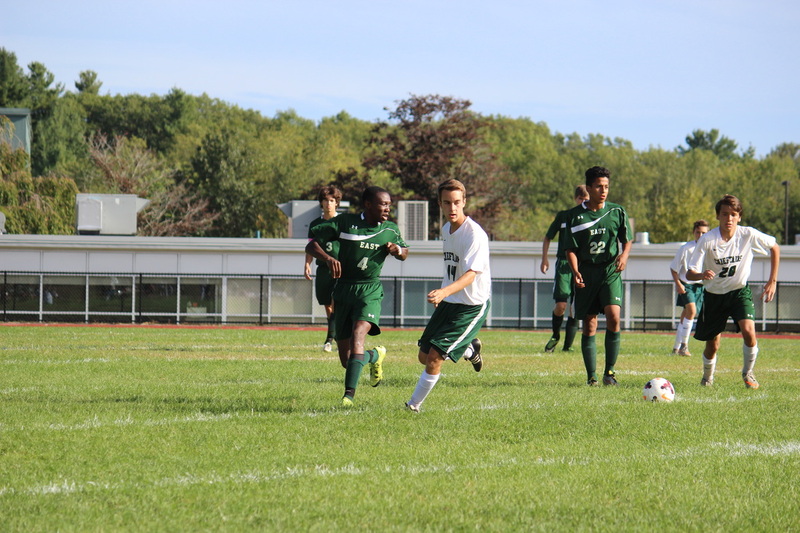 Senior Jimmy Vang (front) and sophomore Gabe Sotelo (back) have helped Cranston East to their best start in 45 years. In a rematch of last year's Division Three Quarter-Finals, Cranston East broke a 1-1 tie and pulled away with a 4-1 victory over Scituate. 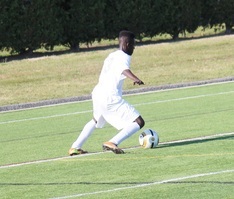 Sophomore Ayo George, who has built a reputation as one of the best defenders in Division Three, helped on the offensive side with one goal and one assist. 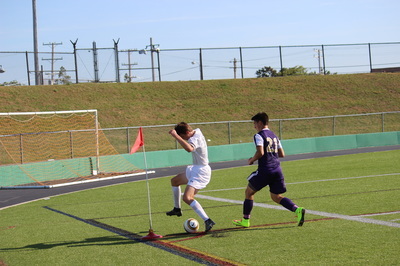 With 11 minutes remaining in the match, George surprised the blue and white goalkeeper, Domenic Dell'Oro with a line shot from 40 yards out to give East a 2-1 advantage. Five minutes later, George found Kevin Donnelly who managed to get behind the Scituate defense for a 3-1 lead. The green and white also received contributions from Richmond Miamen (1 goal), Tiago Pacheco (1 goal) and Kevin Pantoja (1 assist). 'Bolt and Saints play to a 2-2 draw! Jimmy Vang crosses a ball into the box to Richmond Miamen and Kevin Donnelly late in the game. 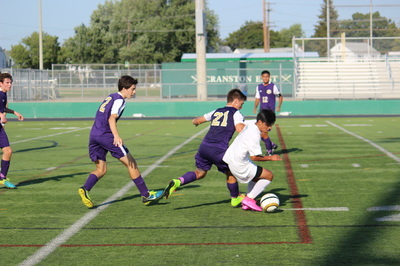 After leading 1-0 at halftime on senior Tiago Pacheco's direct kick at the 9 minute mark, Cranston East could not hold off St. Raphael and had to settle for a 2-2 tie. Tied at 1-1 with 19:33 remaining in the game, senior Kevin Donnelly dribbled past two defenders and blasted a shot by the Saints' goalkeeper. The lead, however, would be short-lived as Rene Ogni caught East off guard 50 seconds later by scoring from 45 yards out. Cranston East wins league opener, 4-0! 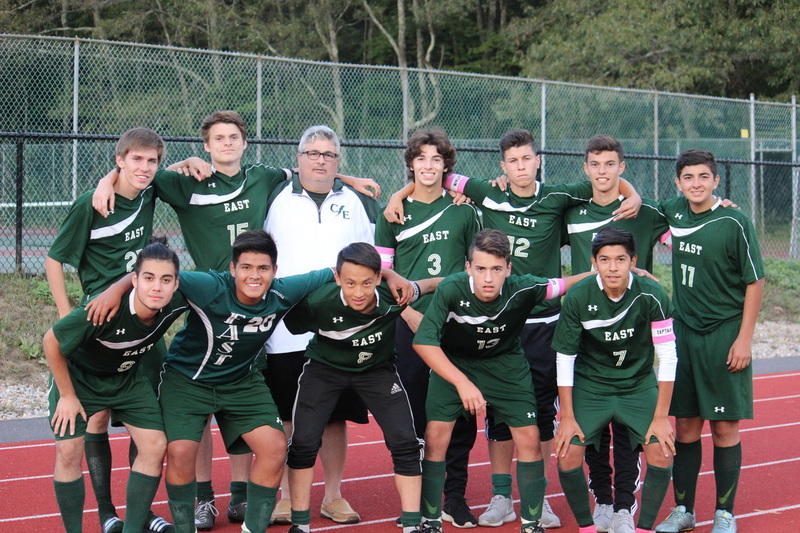 If the the Cranston East boys' team is going to make a run at the Division Three title this season, they will need to rely on the leadership of their senior-laden team. In their league opener against Rogers, the 'Bolt received four goals from four seniors (Tiago Pacheco, Kevin Donnelly, Kevin Pantoja and Jason Venda) to win 4-0. In addition to that, senior midfielder, Jimmy Vang, recorded two assists in the victory. Senior goalkeeper Jarod Linne, who was making his first varsity start, received stellar defense from Pat Finucane, Keith McAteer, Pedro Saravia, Gabe Sotelo and Ayo George to record the shutout. 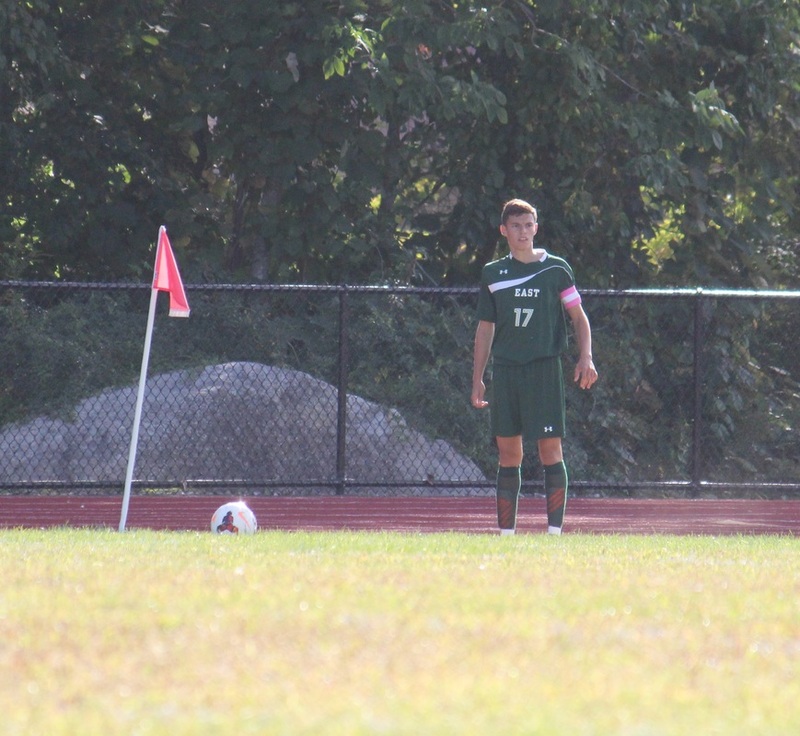 Senior Jason Venda gets ready to take a corner kick for Cranston East against Ponaganset.